Another in my series of posts of ten year old photos: some snaps from September 2004… I don’t seem to have many of interest this month, but oh well. Collins Street and Elizabeth Street, a snap not used in this blog post. Trams were turning around here for a special event up ahead for Olympians returning from the 2004 Games in Athens. 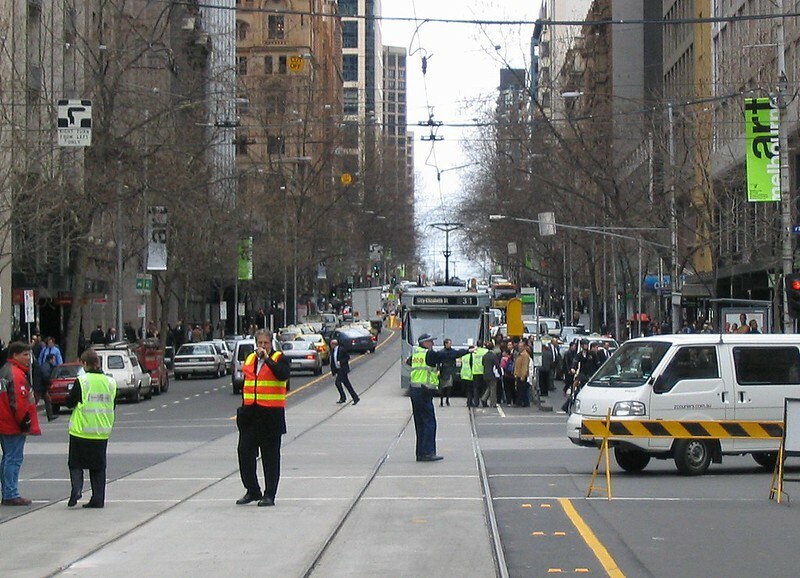 In some ways it hasn’t changed much, but there’s a big tram superstop at this spot now; no more narrow “safety-zone”. 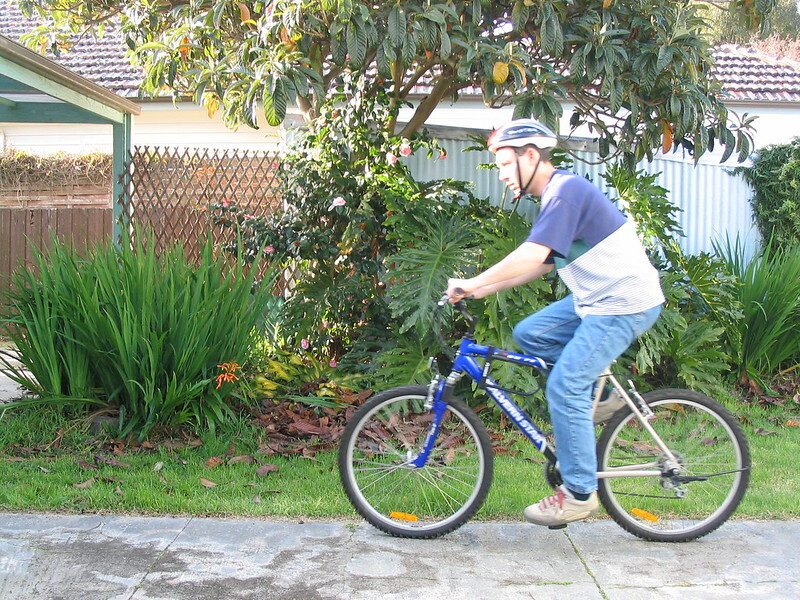 Riding my bike in the backyard, for this blog post. It’s been a while since I’ve ridden the bike — not helped by the lack of bike lanes around here. And I still have that ugly stripy t-shirt. I think that might date back to the 80s — perhaps one of the last Australian-made t-shirts ever manufactured, and it’s as tough as nails; it just won’t die. 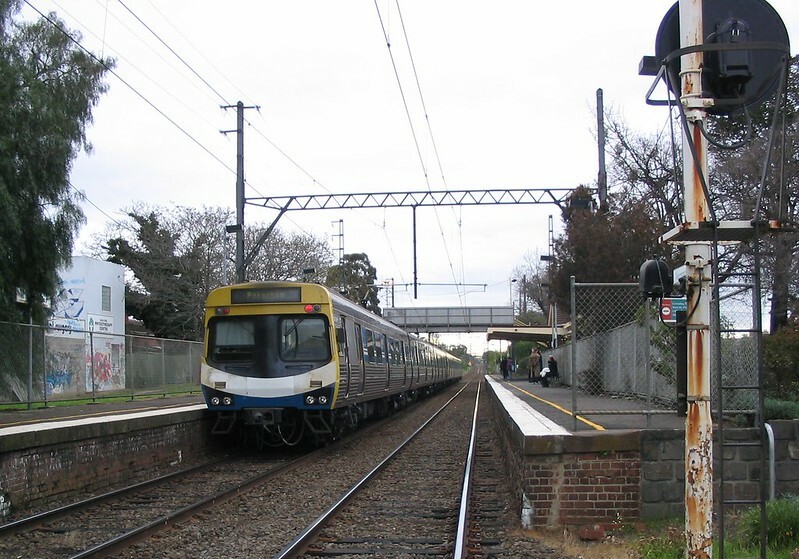 My then-local station Murrumbeena. The train shown is gradually losing its “Moving Melbourne” M>Train colours. The signal looks rusty and ancient… if it hasn’t yet been replaced, no doubt it will as part of the Dandenong rail upgrade. 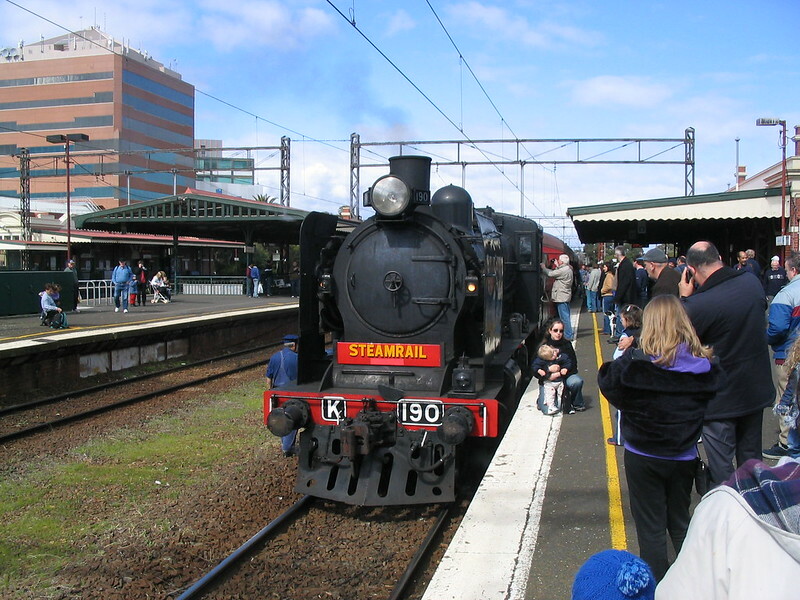 Steamrail K190 at Caulfield on 12/9/2004, marking 150 years of railways in Victoria. We then boarded the train, and I didn’t remember where it went, but apparently it was through the city to Sunshine and back (lots more photos there). Next → Next post: Level crossings: Which are funded to be removed, which are promised? I like the way people step back when more steam comes from the train. Interesting to see the photo of the police controlling the Elizabeth/Collins intersection. I was just there tonight and observed the police attending to dysfunctional traffic signals. They seemed to always stop the trams and change the flow direction, just as they arrived at the intersection. Like they wanted them to wait as long as possible! Why is the bald man in the suit running ? @James – I doubt they were attending “dysfunctional traffic signals” more likely they were just there training new recruits, observing the public, and fining people for Jay-walking. It is a common occurrence at a few of the major intersections in the city.